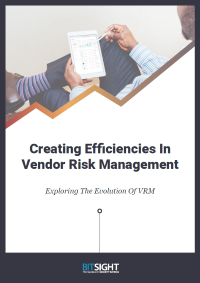 In this eBook, we'll explore how vendor risk management (VRM) has traditionally been handled, why traditional strategies alone are inadequate, and advices for vendor risk managers on how to effectively and efficiently mitigate cyber risk. Vendor risk managers are struggling to meet the cybersecurity and compliance needs brought on by this generation, yet are still following traditional VRM strategies. Organizations need to identify all of their vendor relationships and follow emerging strategies and technologies to make sure their third parties are fulfilling their duties.